Eine weitere, sehr übersichtliche Karte findet ihr HIER! Since Sept. 11, the U.S. has attacked Afghanistan and established at least 13 new military bases in the oil and natural gas-rich countries surrounding it. The bombing of Afghanistan has killed some 3,600 civilians, wrought horrible destruction and deepened mass starvation and displacement. Today there are seven million Afghan internal and external refugees. The U.S. has put back in power the murderous Northern Alliance whom the Afghans threw out some years ago. The administration has publicly threatened to attack 60 more countries, especially Iraq. In violation of international law, it has claimed the right to preemptively strike any country it thinks “harbors terrorists” or might produce weapons of mass destruction. The first use of nuclear weapons, even against countries that have no such weapons, is now official U.S. policy. To carry out this dangerous military project,Washington proposes a 2003 military budget of $396 billion, an astounding 37 percent increase since Bush took office, and more than half of the total U.S. discretionary budget. 845,441 Number of structures (covering 30 million acres) controlled by the Dept. of Defense, the world’s largest landlord. 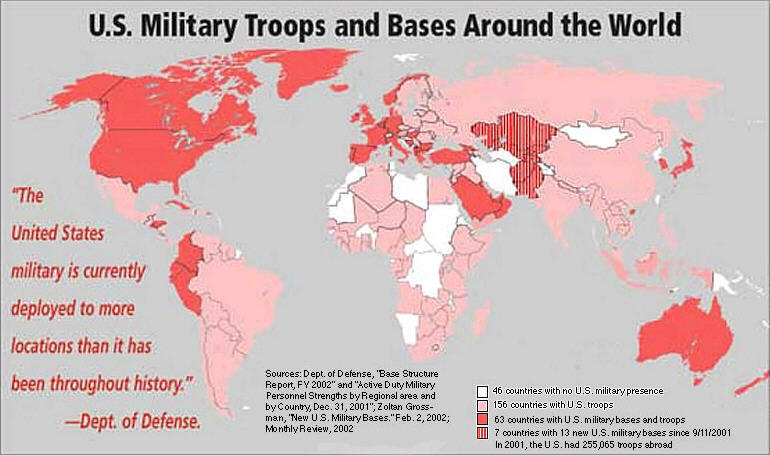 $60 billion Military budget of Russia, 2nd in the world after U.S.
25 Number of top military spending countries whose combined military budgets equals that of the U.S.
Wenn ich obige Zahlen richtig interpretiere, sind in den "156 Countries with U.S. troops" bereits alle anderen Unterkategorien enthalten. Bei momentan 194 Staaten** auf der Welt insgesamt, macht das einen Anteil von 80,41 % aller Länder, die mit US-Militär Anwesenheit "gesegnet" sind. "Wir befinden uns im Jahre 50 v. Chr.. Ganz Gallien ist von den Römern besetz... Ganz Gallien ? Nein ! Ein von unbeugsamen Galliern bevölkertes Dorf hört nicht auf, den Eindringlingen Widerstand zu leisten. Und das Leben ist nicht leicht für die römischen Legionäre, die als Besatzung in den befestigten Lagern Babaorum, Aquarium, Laudanum und Kleinbonum liegen....."
Und wenn jedes dieser "gesegneten" 156 Länder wie z. B. die BRD 1,2 Mrd. Dollar pro Jahr für den "Schutz" an die USA bezahlen, dann kostet das die USA..... na ja, jedenfalls nur einen Teil der oben genannten Ausgaben. Germany contributed over $1.2 billion in 2000 to offset the costs of maintaining U.S. military forces on its soil, representing about 21 percent of U.S. non-personnel stationingcosts in Germany. Almost all cost sharing was in the form of indirect contributions (i.e., waived taxes, rents and other forgone revenues).